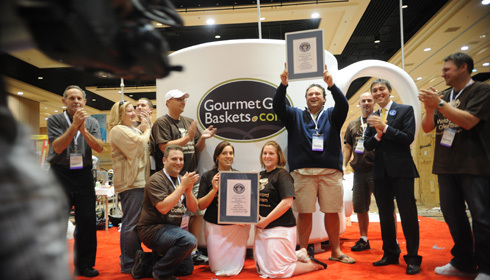 Upon breaking the World’s Largest Cup of Coffee, we also broke the Guinness World Record for World’s Largest Cup of Iced Coffee on October 16, implementing the same system perfected with the hot cup of joe but with a little more tweaking. The iced coffee was required to be below 45 degrees and it took 3,500 pounds of ice to attain the record breaking temperature. Not to mention, we had to empty out 100 gallons of coffee to accommodate the ice and after taking all day to perfect, finally broke the record as the show’s doors were closing! 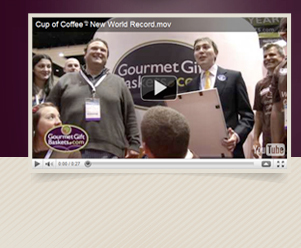 LAS VEGAS, NV (October 18, 2010) As declared at 12 p.m. PST by a Guinness World Record Official, GourmetGiftBaskets.com has broken the Guinness World Record for the Largest Cup of Coffee at Blog World Expo, in Las Vegas Nevada. 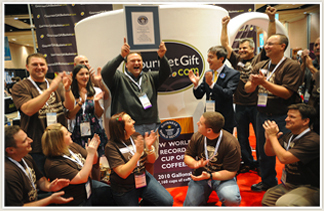 The record in the making began brewing at 4 a.m. PST October 15 and the last cup was poured in right before 12 p.m. A giant 8x8 foot specially constructed coffee mug holds the 2,010 gallons of fresh coffee. 2,010 gallons is equivalent to 32,160 cups of fresh brewed coffee. 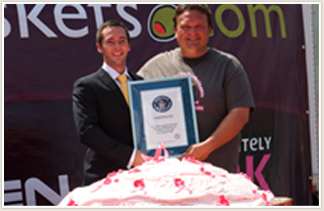 On August 15th, 2009, GourmetGiftBaskets.com broke the Guinness World Record for the World’s Largest Cupcake. 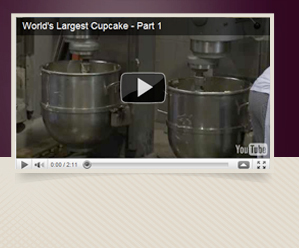 The cupcake most recently crowned “The World’s Largest Cupcake” on July 20, 2009 for a cupcake weighed in at only 151 pounds, and stood just one foot tall by two feet wide. 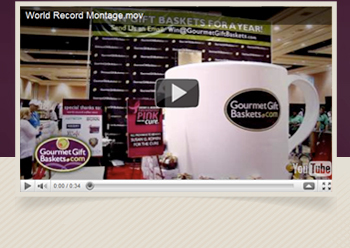 The GourmetGiftBaskets.com cupcake dealt a crushing blow to all previous record attempts, weighing in at 1,224 lbs (555-kilograms)!